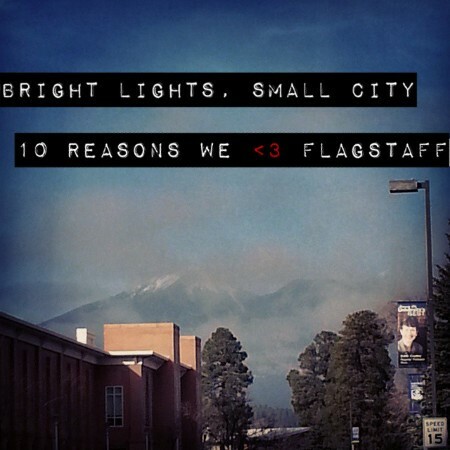 Bright Lights, Small City: 10 Reasons We Love Flagstaff! February is a month of love, so we’re celebrating with a focus on things we love, from home décor to fun holidays and more! The City of Seven Wonders. The Dark Sky City. The apple of our eye. Whatever name we give it, we love our hometown. Flagstaff is a city near and dear to our hearts (and we’re not just saying that because we live here) … here are ten reasons it should be near and dear to yours, too! Flagstaff has a haunting personality … literally. Head to the Weatherford, Monte Vista Hotel, North Morton Hall at NAU, and the Museum Club are just some of the local spots where you can witness (or at least hear plenty of stories about) some freaky paranormal activity. Whether you’re a skeptic or a full-blown believer, we recommend taking a Haunted Flagstaff tour at least once while you’re here! Okay, so maybe we’re not talking about hanging out with the likes of Brad Pitt or Taylor Swift … But you can get an up-close and personal look at one of the best views of the cosmos right here in town at the Lowell Observatory. Pluto is still a planet in our hearts (yep, it was discovered at Lowell in 1930), and NASA’s New Horizons spacecraft is on the cusp of reaching it in July! So be sure to celebrate the “Year of Pluto” throughout 2015 at the observatory! Head out into the great green landscape of Flagstaff and enjoy the Flagstaff Urban Trails System, or FUTS. Flagstaff has a reputation as a mecca for outdoor enthusiasts, and the more than 50 miles of trails on the FUTS tells you all you need to know about why! You can enjoy other outdoor rec at Thorpe, Buffalo, and Wheeler Park, and other nearby parks, trails, and expedition hubs. One of Flagstaff’s most “tree-rific” spots in Flagstaff Extreme. Enjoy the zip line and both kids’ and adult adventure courses that take you out of your comfort zone and into the pines! Flagstaff is already a great city to roam the streets in … but the Alpine Pedaler takes your journey to a whole new level. Reserve your own seat or enjoy a private group ride with up to 14 pals as you pedal your way along a two hour pub crawl with VIP discounts at all stops! If you haven’t yet, make sure you take at least one night to head outside and stare up at the beautiful starry sky over Flagstaff! As the world’s first International Dark Sky City, Flagstaff’s commitment to dark sky preservation means good things for the earth and great things for star gazers. While we love Lowell Observatory, we love even more the fact that you don’t need a telescope to scope out millions of stars on a nightly basis. Still, if you’re looking for a great spot for your stargazing, we recommend heading up to Mars Hill right below the Observatory where you’ll get a great view of the city and the sky! Not part of the Starbucks crowd? Flagstaff is a coffee lover’s dream with many small coffee shops and cafes, and one of our favorites is Macy’s! Stop in for a delicious cappuccino, hot cup of tea (we’re going Star Trekking with a cup of Earl Grey, hot), or a one of a kind breakfast, lunch, or dinner platter. Macy’s represents Flagstaff’s passion for supporting both the local and global community. For an old fashioned, made from scratch treat, don’t miss Macy’s! You’ll find the most dapper baristas in town at Rendezvous, a classy Flagstaff hot spot connected to the Hotel Monte Vista. A coffee house by day, Rendezvous will also tantalize your taste buds as a martini bar by night. Grab a board game and relax in the intimate atmosphere at Rendezvous, and don’t be surprised when the hours fly by and you find yourself unable to leave. Not only are you super close to all the action downtown (Heritage Square is right up the street), but your taste buds will thank you as you enjoy unique coffee blends, ridiculous martinis (you’ll be saying “Holy Moly!” the first time you try their Holy Mole), and yummy pastries. Celebrate all things Flagstaff at the Hullabaloo. Celebrated annually at Wheeler Park, this wild and wacky festival has been voted the Best Annual Event or Festival by the Arizona Daily Sun readers since 2010, and there’s no sign of that changing. There’s a crazy costume contest, micro-brews, bounce houses, music, raffles, food, puppets, and more! The only thing we’re not crazy about are the clowns … but we’re more than happy to forgive their presence for the sheet quantity of awesome at this event! Flagstaff’s First Friday ArtWalk is an awesome way to explore all of Downtown, see great art, enjoy live music, and more. Take in Flagstaff’s monthly street party … you never know what you’ll see! Hundreds of local artists are featured every month, and you never know what fun surprises will pop up around every corner! Want a full day of fun in Flagstaff? Check out the “Things to Do in Flagstaff, Arizona” Facebook page! 2019 Bella Investment Group, LLC. All rights reserved.